Electricity is one of the most important power sources that we all use every day. But if it’s not properly managed it can cause serious injury and death. Test and tag is the process of checking electrical appliances for safety through a series of visual inspections and functional tests. All items should be labelled and logged in an electrical appliances report. In our industry, testing and tagging electrical equipment is an important and crucial job which should not be underestimated. Faulty electronics, equipment, and wiring can put people at risk of electrocution, electrical burns, or injuries due to fire. Frequent handling of equipment can lead to damaged and unsafe equipment in our facilities. Test and tag is a vital way to maintain the integrity of your electrical appliances – ensuring that your facility is safe for all its occupants and visitors. If an accident does occur, there may even be less risk of prosecution if you are able to show that you regularly engage in test and tag services that comply with the Australian safety standards. Inspections and testing must be carried out by a competent person, which depending on your jurisdiction might be a licensed or registered electrician or a licensed electrical inspector. To ensure that your testing is always up to date, choose a test and tag provider that will send you alerts when your tags are about to expire, and a thorough report of the items tested. Polarity– to determine whether the active and neutral of the plug end are correctly connected to the corresponding terminals at the socket end. Worksafe Victoria advises that all portable, non-hard-wired appliances, lead, and power boards should be regularly inspected to meet Section 21(2)(a) of the Victorian Occupational Health and Safety Act. Items that are had wired and fixed in place do not require testing. 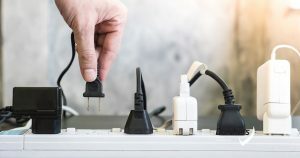 According to Worksafe Victoria any residual current devices, portable electrical equipment, portable electrical tools, and extension cords should be tested and tagged on average every 6 to 12 months depending on the environment of the workplace. A harsher work environment, for example a construction or demolition site, has a higher potential for damage than a quieter office environment, and therefore should have its equipment tested more frequently. At Danihers Facility Management, we have several business units that we trust to conduct inspection, testing, and tagging as per the Australian Standard AS/NZS 3760.